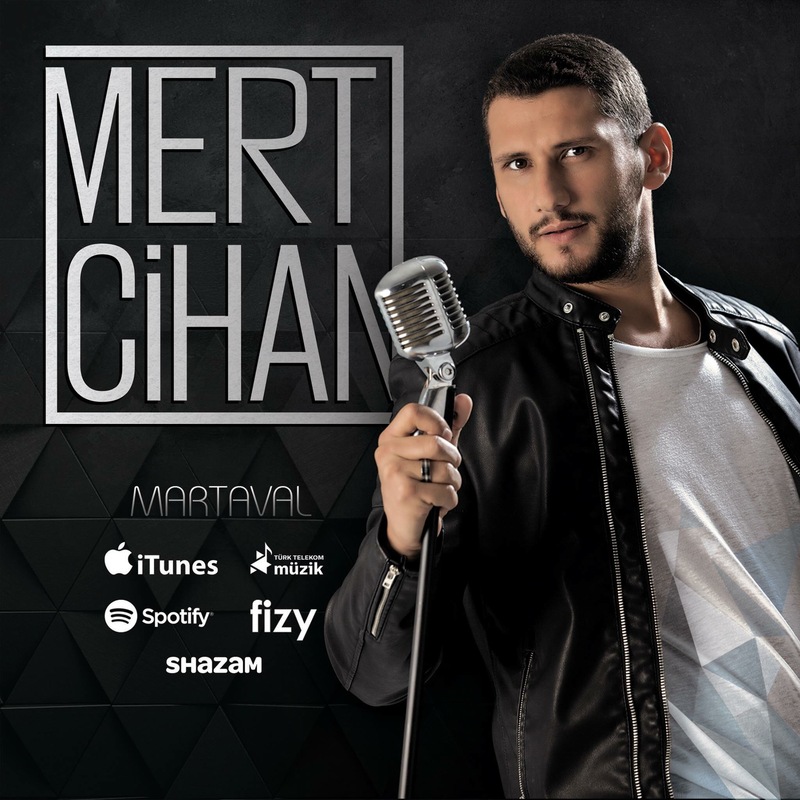 Mehmet Baydur’un 1990 yılında yazdığı Yangın Yerinde Orkideler adlı oyunu seyirciyle buluştu. İstanbul Büyükşehir Belediyesi Şehir Tiyatroları, Mehmet Baydur’un 1990 yılında yazdığı Yangın Yerinde Orkideler adlı oyunu seyirciyle buluştu. Hülya Karakaş’ın yönettiği ve şarkı sözlerini yazdığı oyun 5 Ekim 2016 Çarşamba günü saat 20.30’da prömiyerini yaptı. 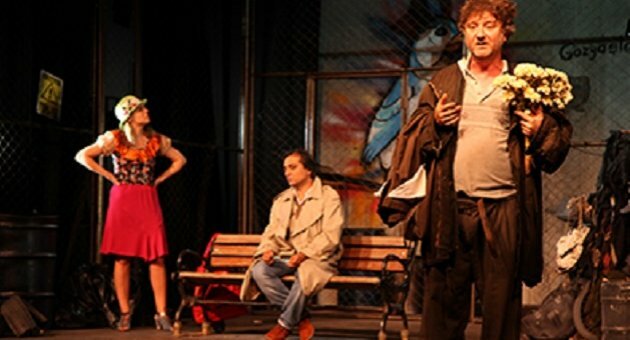 Müziklerini Cihan Kurtaran’ın, dramaturgi’sini Ergün Özdemir’in, sahne tasarımını Almila Altunsoy ve Cihan Aşar’ın kostüm tasarımını Almila Altunsoy’un, ışık tasarımını Mahmut Özdemir’in, koreografisini Özge Midilli’nin yaptığı oyunda; Emin And, Eraslan Sağlam, Can Ertuğrul, Zümrüt Erkin, Ömer Barış Bakova ve Gözde İpek Köse rol alıyor. 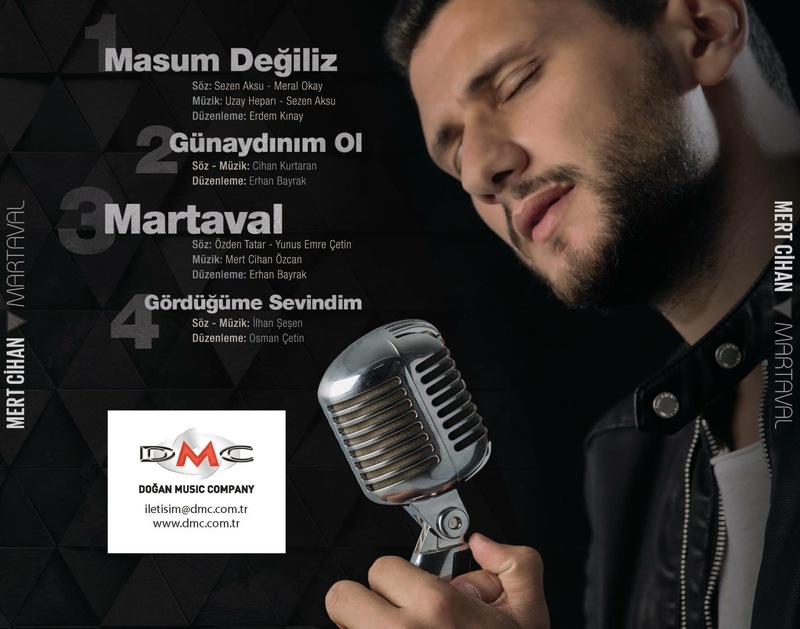 Musicians from five Asian countries — Korea, China, Mongolia, Uzbekistan and Turkey– will present their sounds in harmony with one another. The musicians will hold a special concert, “Silk Road, Sori-gil Road,” as part of an upcoming “Silk Road Cultural Festival in Gyeongju 2015,” set to kick off on Aug. 21. The 59-day series of events will take place across the city of Gyeongju in Gyeongsangnam-do Province (South Gyeongsang Province). It is designed to connect all the Eurasian nations that lie along the ancient Silk Road caravan route. During this Silk Road festival, participants will be able to indulge themselves in a variety of festive programs, including traditional performances, puppet shows and exhibitions, all aimed at shedding new light on the ancient Eurasian civilizations and on the Silla Kingdom (57 B.C.-A.D. 935). 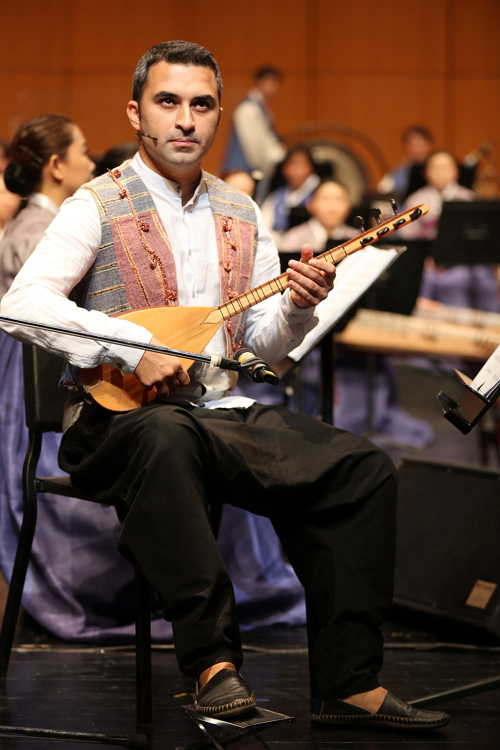 Farhodjon Gapparov, a musician slated to play during the ‘Silk Road Sori-gil Road’ concert on Aug. 30, plays Uzbekistan’s stringed gijjak. Yang Wen Na, a Chinese musician, plays the two-stringed erhu (二胡). 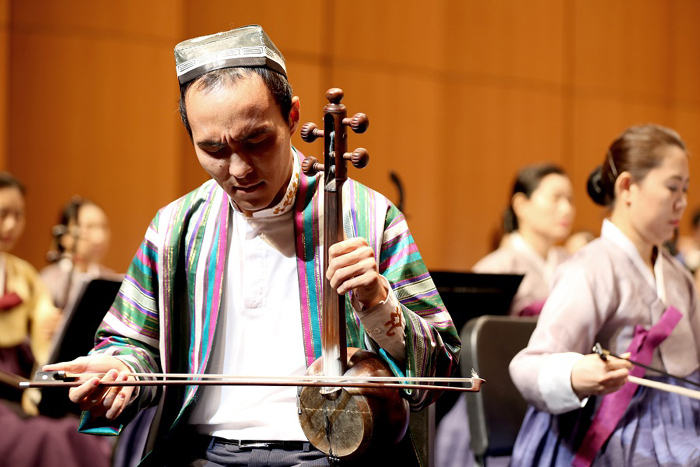 The “Silk Road, Sori-gil Road” concert, scheduled to take place on Aug. 30 at the Goyang Eoulimnuri hall in Gyeonggi-do Province, will be a chance to hear traditional sounds indigenous to the five countries along the ancient Silk Road trade route. 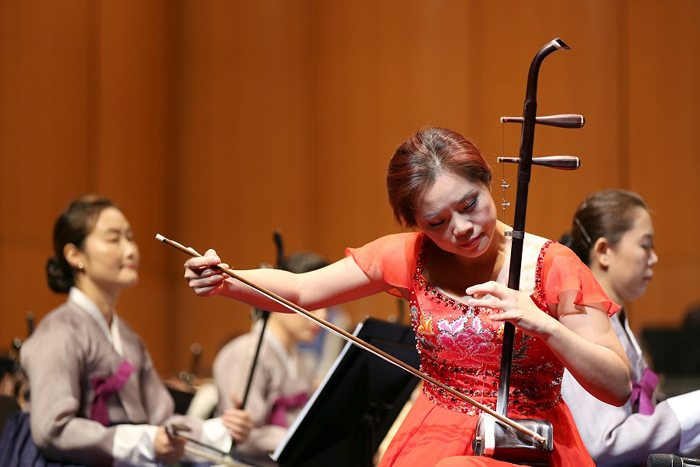 Music will ring out across the hall, being played on Turkey’s plucked bağlama stringed instrument, Uzbekistan’s violin-like gijjak, Mongolia’s two-stringed morin khuur and China’s fiddle-like erhu. Traditional Korean percussion arrangements by the renowned Kim Deok-su Samulnori group will meld with the sounds on stage, too. There will also be a rare chance to hear traditional Mongolian throat singing, known as khoomii. Cihan Kurtaran from Turkey plays the traditional Turkish stringed bağlama. 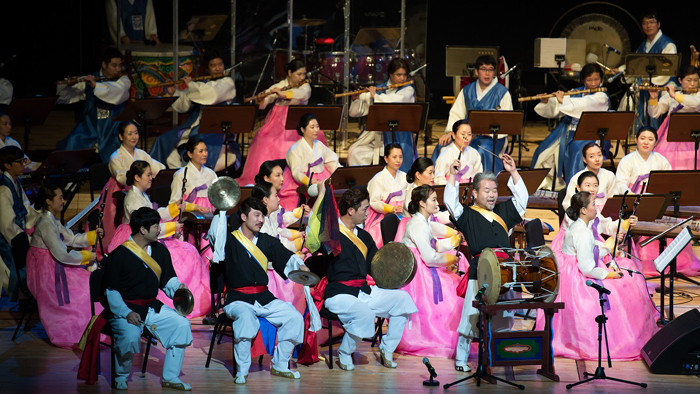 The Kim Deok-su Samulnori group plays traditional Korean percussion music. “This concert aims at opening a new path allowing Eurasian nations to get closer to each other through music, traditions and the arts,” said an official from the concert’s organizing committee. 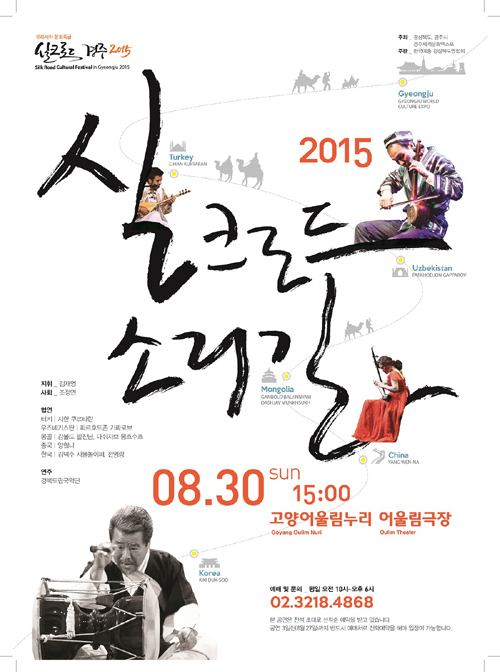 The “Silk Road, Sori-gil Road” concert will begin at 3 p.m. on Aug. 30 at the Eoulim Hall in Goyang, Gyeonggi-do Province, and it is free. The official poster for the ‘Silk Road Sori-gil Road’ concert.